HH the Emir Sheikh Tamim bin Hamad al-Thani and HE the Foreign Minister Sheikh Mohamed bin Abdulrahman al-Thani during their meeting with the heads of diplomatic missions of Qatar abroad. HH the Emir Sheikh Tamim bin Hamad al-Thani yesterday met the heads of diplomatic and counsellor missions of Qatar abroad. HH the Deputy Emir Sheikh Abdullah bin Hamad al-Thani attended the meeting. During the meeting the Emir praised their efforts and their good representation of the country and contribution to building bridges and co-operation between Qatar and friendly countries, as well as looking after the country’s interests. 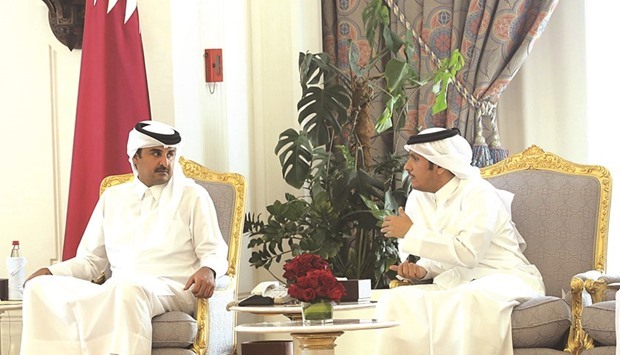 HH the Emir also stressed the importance of putting more efforts into clarifying Qatar’s positions and its positive political role, given their primary role in representing the state abroad. The Emir wished them well in accomplishing their missions.